No one gets a cheap phone because they want to have a sub-par experience filled with stuttering and lagging apps. People get cheap phones because they’re cheap, and usually work just enough to justify the low price point. Take the Alcatel 1X, for example. It’s neither novel nor intriguing. It’s not trying to impress you. Hell, it runs on an operating system designed explicitly for underpowered devices. But it’s £100, and that sure is cheap. Whether you can stomach how cheap it feels is another thing entirely. 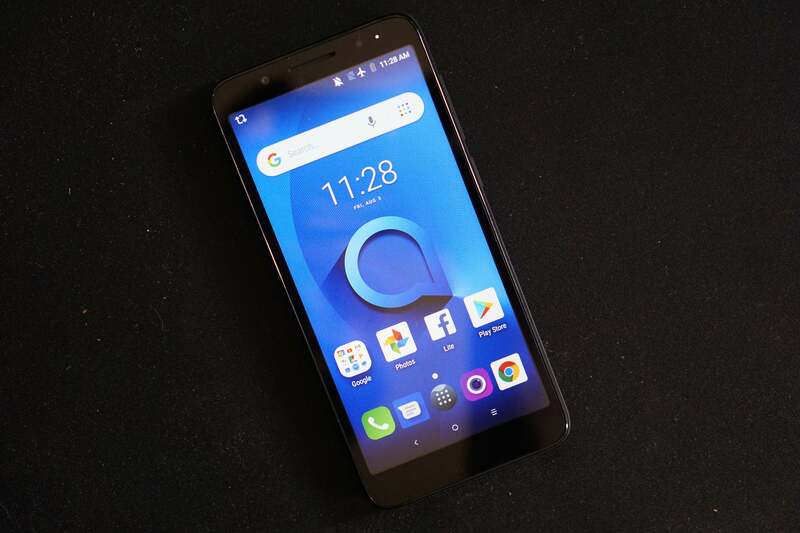 Right off the bat, the Alcatel 1X looks like the world’s most generic smartphone. On the front is its 5.3-inch 480p display with an 18:9 aspect ratio, giving you more real estate when doing anything unrelated to watching videos. The display’s glass is surprisingly difficult to scroll on, but the rough suede-like finish on the rear of the 1X is surprisingly appealing, even if the fingerprints left on the back after a particularly humid summer day are kind of gross. The rear fingerprint reader was a disappointment more often than not; its poor performance means unlocking the phone with a PIN is easier than using the hit-or-miss biometric tool. It uses a 3.5mm headphone jack and Micro-USB port, which is no doubt a cost-saving measure anyone purchasing the 1X probably won’t mind. The rear 8-megapixel camera and front-facing 5-megapixel camera (which includes a convenient front-facing LED) is predictably sluggish, and the somewhat unresponsive touchscreen means you’ll have more luck snapping a photo with the volume buttons rather than the on-screen shutter button. Please, don’t photograph anything important with this. The 1X’s 1.3GHz Mediatek quad-core processor, made specifically for budget phones, means you shouldn’t expect much in terms of raw power. There’s a surprising amount of stuttering scrolling and dropped frames in apps and games, and Alcatel’s light skinning of the UI doesn’t help. Since it’s lacking in the graphics department, games like Riptide GP2 will run (poorly), while a game like PUBG will let you go through the entire download and update process before telling you your phone is too slow to actually enjoy what it has in store. The hardware leaves a lot to be desired, but the lightweight operating system is brand spankin’ new. It runs the Android Oreo Go edition, which is meant primarily for developing countries where people are more likely to purchase inexpensive smartphones compared to the more popular (and pricey) ones from companies like Apple, Google, or Samsung that cost many hundreds of pounds. With a smaller footprint that allows for more internal storage, Android Go recognises that every megabyte counts, which is why Google created “Go” apps designed to take advantage of the device’s limitations. Still, the Go apps are more like HTML5-based webapps, and apps like Maps are missing key features like turn-by-turn directions, the perfect example of what you lose with a super-budget phone. But as mentioned, many apps not optimised for Android Go run in spectacularly poor fashion on the 1X. And it would be nice to know whether an app can run on the device before you download it rather than afterward. The Alcatel 1X is a cheap smartphone, plain and simple. There are neither bells nor whistles to be had. Even something like eSIM support, a theoretically perfect addition to what one might use as a burner phone abroad, is missing. With an inconsistent fingerprint sensor, low-resolution display, and sluggish camera, the 1X is exactly what you’d expect to get out of a £100 smartphone, and that’s disappointing. Cheap smartphones have come a long way, and for another £140, you can get a smartphone like the Moto G6, a damn good phone worth the extra coin. Of course, if you’re eyeing a £100 phone, spending more may not be an option. And in that case, the Alcatel 1X gets the job done—it has apps, it lets you get online, it has a camera. It makes phone calls! It’s a smartphone at its most basic, and hey, that’s better than nothing.